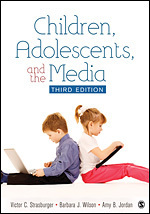 Children, Adolescents, and the Media, Third Edition provides a comprehensive, research-oriented overview of how the media impact the lives of children and adolescents in modern society. The approach is grounded in a developmental perspective, focusing on how young people of different ages and levels of cognitive, emotional, and social development interact with the media. Incorporating the most up-to-date research available, Authors Victor C. Strasburger, Barbara J. Wilson, and Amy B. Jordan target areas most controversial and at the heart of debates about the media and public health—equipping students to approach the media as critical consumers. The volume has also been translated into Chinese and Portuguese.